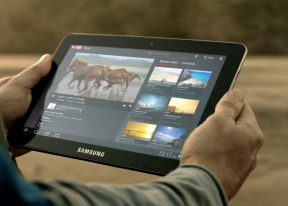 The Samsung Galaxy Tab 10.1 comes with a GPS receiver, which got a satellite lock in under two minutes with A-GPS turned off. A-GPS can speed this up quite a bit, but requires Internet access. We gotta say, we didn’t experience any issues with the GPS performance. The Galaxy Tab 10.1 comes with Google Maps and Navigation. Voice-guided navigation has become a viable solution since the v5.0 update. Vector maps are smaller and way easier on your data plan and with the Navigation itself becoming available in more and more countries 3rd party SatNav apps are facing extinction. The additional applications are the heart of every modern mobile platform. The more and the higher-quality they are the better the market prospects of their OS. For the Galaxy Tab 10.1 this is a two-sided tale. You get a customized Android market interface that lets you browse and search the hundreds of thousands of apps there quicker than ever before. The productivity is probably the best there is on the market and gaming is second only to the App store. On the other hand, the large portion of those is still not exactly tablet-friendly. Some just don't have WXGA versions and stretch their WVGA ones (which isn't too bad, but certainly isn't ideal) and some are simply performing terribly. We were quite surprised to find that apps that run fine on single-core WVGA handsets and that we would’ve assumed to be a walk in the park for the Galaxy Tab 10.1 would stutter quite heavily. Luckily we do notice a major improvement, compared to the early days so things are obviously moving in the right direction. And it's hardly any wonder - the Android slates now account for a third of all tablet sales out there, so coders have every reason to show their commitment. Plus with cooler and cooler Honeycomb slates coming up (not to mention the improvement in the platform itself), things are bound to improve even further. And quite rapidly, if Android's smartphone history is anything to go by.